Bachelor of Arts Tu Tira Mai student Kelly Langton (standing) with members of the Opunake Business Association. It’s almost the last straw for Opunake where residents will soon say good riddance to single-use plastics. The Taranaki coastal settlement could soon become New Zealand’s first town free of single-use plastics thanks to a team of third-year Massey University Bachelor of Arts students. The students launched a campaign recently calling for the local business association to commit to a plastic-free vision. The project is in fulfilment of a new paper on civic and community engagement, part of Massey’s revamped BA programme designed to give students the opportunity to engage in research and planning for social change. One of the five team members, Kelly Langton, who is based in Opunake (60km south of New Plymouth), says the students are thrilled with the success of their project which made front page news in the Taranaki Daily News. 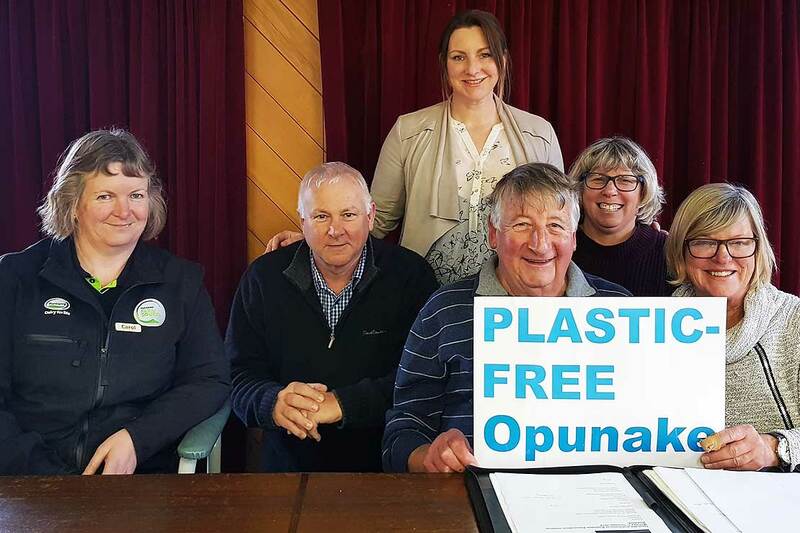 Their campaign resulted in the Opunake and Districts Business Association signing up to a single-use plastics free vision following a petition of local businesses and residents signed by more than 900 people in October. Ms Langton says the business association supports the idea and wants to develop a strategy early next year to develop a plan on how to phase out single-use plastic bags, straws, water bottles and other forms of packaging. She will be part of the team working on how to turn the vision into a reality. Already, local food and grocery suppliers are sourcing bio-gradable or re-useable alternatives to single-use plastics – from tomato sauce sachets and straws to garments packed in soft plastic. Many are questioning the suppliers of the goods they sell, and that’s where change is going to be most effective, Ms Langton believes. She says plastic is not “evil” in itself, but the excessive use of it is the issue, as we witness the amount that ends up in landfill, or worse, in the oceans and rivers where it does not break down for hundreds of years. Part of her role in the plastics-free status of Opunake is helping local businesses to become informed about the range of compostable, biodegradable or re-useable alternative packaging alternatives and to find out what their environmental impact is, compared with single-use plastics. Ms Langton, an economics major, combines full-time study with raising her three children aged four, three and eight months with helping to run the family dairy farm as well as contracted work for various councils and government departments. She is also the new group welfare manager for Taranaki Civil Defence. She decided to return to study after starting a planning degree at Massey 15 years ago, then took a break when she was offered a council job. The team entire behind the plastic-free initiative is comprised of distance students who came up with the idea through online collaboration from their screens in Taranaki, Auckland, Whakatane, Hastings and New York. New York-based David Welch (social anthropology major), created the video in support of the campaign, while Lyndsay Ralph (sociology major) from Hastings, set up the petition. “It’s heartening to see the example a small community like Opunake can set,” she says, and hopes bigger centres will follow the example. The five are in the final year of their Bachelor of Arts (BA) degrees and also include: Cameron Holmes (Whakatane) majoring in psychology and Michael Forgesson (Auckland) majoring in security studies. The campaign was part of a new BA core paper, Tu Tira Mai: Practising Engagement, which requires students to undertake a civic action project where they use research, problem-solving and ethical skills to address a social or humanitarian issue. Course coordinator Gradon Diprose says the students have undertaken a wide range of projects in the course, from creating videos to raise awareness about consent and the effects of racism, to submissions to central government and developing educational resources for community partners. Watch a video produced by David Welch for the team here.